Unique Zodiac Pendants for menThere are 15 products. Unique Zodiac pendants for men are hand-made with unique motifs of twelve zodiac signs. If you want to give a very special, different and original unique gift to your partner, husband, business partner, friend or your child, they can be more than suitable for: birthdays, anniversaries, as a business gift, as a New Year's Eve gift, as a Christmas gift or a gift just for fun. Each Zodiac pendant is unique and handmade, each motif of a particular zodiacal sign is handmade and different from others. All Zodiac pendants are made from skin friendly materials and are nickle-free, so they can also be worn by people with allergies. Unique, hand-made Horoscope pendant for men with a Zodiac sign of Capricorn. 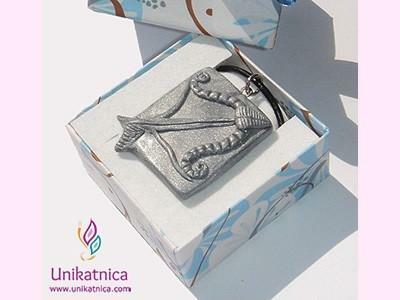 Unique, hand-made Horoscope pendant for men with a Zodiac sign of Sagittarius. Unique, hand-made Horoscope pendant for men with a Zodiac sign of Libra. Unique, hand-made Horoscope pendant for men with a Zodiac sign of Virgo. Unique, hand-made Horoscope pendant for men with a Zodiac sign of Cancer. Unique, hand-made Horoscope pendant for men with a Zodiac sign of Pisces. Unique, handmade Zodiac pendant for men with a designer Zodiac sign of Aries. The Zodiac pendant is made from Cernit and Fimo Clay and in nickle-free. Because of neutral colours it is also suitable for women. Unique, hand-made Horoscope pendant for men with a Zodiac sign of Aquarius.